I can hardly believe that my Grain Drain detox week is already at an end (that, and the fact I’ve posted a measly TWO food-related blog entries about it!). Another reason for the paltry recipe output has been my own shift in appetite during the past week. Even though I consumed three squares and several snacks a day, I was drawn to old, familiar dishes for the most part, and felt no impetus to experiment in the kitchen. Whether this change in attitude is connected to the cleanse or not, I have no idea. I did, however, cook up one or two worthwhile grain-free dishes, so I will definitely share those in drops and dollops over the next while. Some of you have asked how I felt during the cleanse. Overall, it was a success. There were some expected–and some highly unexpected–results. As with any cleanse, I went through a bit of a detox reaction for the first couple of days, though nothing as dramatic as my first healing crisis a decade ago. I felt fatigued, a bit lethargic, and experienced a few mild cravings for the first day. Then, somehow, the toggle switch governing consumption was flicked and I was able to spend the rest of the week happily ingesting only those healthy foods I’d selected for the cleanse: fresh and dried fruits, vegetables, nuts, seeds, and beans/legumes (or pulses, depending on your geographical location). In general, my diet consisted of the following types of foods: for breakfast, I might have fresh fruit and nut butter (or nuts and seeds), alternating with freshly squeezed vegetable juice or a smoothie (and the occasional Earth Bowl). Lunches consisted of salad with more nuts/seeds if I felt hungry; snacks were fruits and vegetables or some kind of raw bar or nibble; and dinner was typically a cooked dish with vegetables and/or nuts or legumes. I kept the meals relatively simple–perhaps my body was telling me I needed simplicity in at least one area of my life this week! Now, for the unexpected. I must admit I was entirely amazed at how easy the process felt (and if you’ve read my blog before, you know that avoiding chocolate and sweets is generally anything but easy for me). After the first few cravings, I was able to virtually forget about chocolate and simply eat good, hearty, nourishing foods. At the same time, my portion size seemed to shrink all on its own volition, almost without help from me. I feel certain I’ve lost some weight, if only a milligram (will report on the Progress Tracker at the end of the course). I did experience a couple of odd detox reactions, however. According to Paul Pritchard (as well as many other holistic practitioners) in Healing with Whole Foods, the liver is the seat of anger in the body. In other words, mess with the liver and you might just stir up some pretty unattractive emotions. Well, I’m here to report that yes, the theory happens to be true! As my liver was flushed of toxins, my emotional fuse shrank along with the portion sizes and I’m afraid I snapped at the poor HH on more than one occasion (The Girls, of course, were left unscathed). Now I understand why people run off to spas to detox–at least they won’t take out their burbling anger on their families that way! In any case, to acknowledge my “graduation” from the cleanse, I prepared one very special raw dessert: Raw Milky Way Bars. I first spied these on Terilyn’s The Daily Raw Café about a month ago and immediately knew I’d have to try them. They seemed the perfect finale to a great week of healthy eating–a little decadent, but still rife with wholesome raw nuts, dates, and natural sweeteners. And they were, indeed, thoroughly enjoyable, though I’d add a little caveat if you plan to try them. While the flavors were astonishingly good (and very close to what I recall as the original mix of flavors in the candy bar), the chocolate coating firms up only when fully frozen–and begins to thaw immediately upon removal from the freezer (or, perhaps, this was simply a function of our humid, 31C–about 88F–temperature here today). No problem there, as long as you eat the bars straight from the freezer. However, if you (as I do) prefer the nougat and caramel at room temperature, you’re out of luck; you’ll end up with a cube of yummy nougat dripping with slick, sticky chocolately coating. 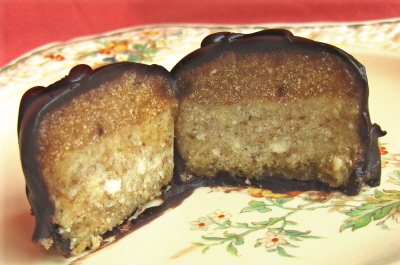 In fact, I found the nougat filling, a mix of powdered nuts and agave nectar, to be so enticing on its own that I plan to use it as a filling in regular chocolates, made with a bittersweet chocolate coating. But that’s for another day. In the meantime, I thought I’d close with a play on the “graduation” theme and join in the fun prom meme introduced by Alicia at Grumpy Chair Dieter. She suggests that we all pull out our prom photos and post them. Well, unfortunately, I couldn’t find my prom photo (aww, gee, and I so wanted to share it!). Instead, I managed to suss out this ancient photo (taken before the advent of digital cameras–gasp!) 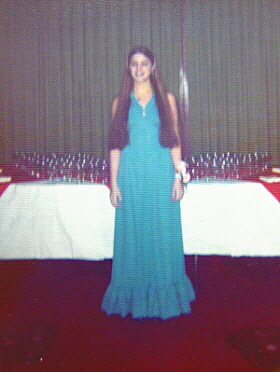 from my “Sweet 16” party (hmm, now I wish I had found the prom photo. . . ). Yes, that is I, braces and all. Dig that dress! Dig that hair! Perhaps most shocking of all–I considered myself “obese” at the time. These days, I’d be thrilled if my thighs were as small as my waist was then. Thanks, Grumpy Chair, for prompting me to browse through those old photos and get some perspective! Have a good weekend, all. And now, I’m off to go eat some grains! Reminiscent of the chocolate candy bar of the same name, these are actually pretty good for you. I made 1/3 recipe (I was afraid I’d eat them all otherwise), and it worked out just fine. Soak the dates in the water and lemon juice for an hour. Drain and reserve soaking liquid. Meanwhile, make the nougat. Nougat: In a coffee grinder, grind the cashews in small batches into a fine powder. Remove. Process the almonds the same way. Place a piece of plastic wrap on a cutting board. Form the nougat into a long rectangular bar on top of the plastic wrap. Place the board in the freezer for an hour. Caramel: To make the caramel, process the soaked dates, coconut oil and sea salt in a blender. Use the soaking liquid, one tablespoon at a time, to soften the mixture as you blend. Blend until you achieve a thick creamy mixture. Spread the caramel in a long strip on top of the nougat (use a knife or offset spatula to spread it evenly across the top of the rectangle). Return to the freezer while you prepare the chocolate. Chocolate: In a large bowl, whisk together the cocoa powder, maple syrup, and coconut oil together until smooth and creamy. Pour the chocolate over the candy pieces and freeze an additional hour or until the chocolate sets. Use any extra chocolate to drizzle patterns over the tops of the bars. Yields 15-20 small bars. Congratulations for ending the detox!! WOW do those raw milky way bars look divine – yum! i second the milky way bar yumminess! i’m glad your detox was a success! i started a digestive cleanse this week that will last for two months, partially prepping for my raw cleanse and a general detox, and already i feel lighter and more awake (despite giving up caffeine!). so far, no grumpies, but the cleanse is young! I like this recipe – it looks much richer than it is and the flavours that went into it all sound terrific. Good for you! You are way ahead of me on that one. I’d love to do a juice fast one day, but will definitely have to work my way up to it. I can’t wait to see what kinds of things you do on your raw and detox diets! It did turn out better than one would expect, given it’s all raw and has none of the ingredients in the original! Whoa, I’ve never even had a Milky Way bar but I want one! Aww you’re so cute on your sweet 16! We really should do at least a mild one over here. DH has been having sinus related problems for the better part of two years. We have identified some of the triggers but others are still very much a mystery. I am drooling over these bars, Ricki! I will give them a go, but I think I will just melt some dark chocolate over them. What a cute sweet sixteen photo! And the detox sounded great, good time of year. Oh wow, you were beautiful! I love the long, long hair! And the dress is my favorite color. And oh those milky way bars! Those treats are beautiful! Seriously, they are gorgeous–you are quite the food stylist, cook (un-cook?! ), and photographer. I am happy to hear that the detox went well and that you felt better while doing it (well, more energetic anyway)…I am sorry, however, that you were a bit snappy. I bet it was just because you are usually so sweet and nice that HH even noticed it! The Grain Drain detox week sounds interesting. Those Milky Way Bars look really good. Your hair in that photograph is gorgeous! Did you ever cut it, or is it still long and lovely? Raw Milky Way bas? Seriously? I am stuffed from dinner and already trying to convince myself that there is room in my belly for those! Thanks for the tip on freezing shredded zucchini. I am always afraid freezing veggies will turn them brown and funky. The wee chick bowl is cute, I agree! I have one with penguins too. They are so fragile though. I think I’ve broken two in the past! They are meant to be rice bowls for tots, but whatever, adults can have fun bowls too! Congrats on graduating from the cleanse! Yippie! Congratulations on finishing the cleanse! It’s inspiring. I’m sure I’d want to quite after half a day was over! The milky way bars look amazing – and not entirely unhealthy yaey. I really feel motivated to try to do a cleanse, due in large part to your posts! Need to try the milky bars, and OMG I love your hair in the pic!!! Is it still long? Thanks for playing along Ricki. You are too cute and I gasped when I read you thought you were obese! That is crazy. Your 16 year old self, looks like an after picture . . . not a before. You were gorgeous! I know what you mean about the liver and anger..
Those raw milky ways look amazing.. I may have to make them for my restaurant! Yay, you made nougat! I need to make myself a snickers bar now. It is amazing how a detox can highlight some food allergies, as you really notice a difference once they’re gone. Already, my congestion is returning, after only 2 days of (minimal) grains! (I’m pretending there’s no connection, though, as I can’t see giving up grains indefinitely. . .). I’d do the exact same thing next time. That way, they won’t even have to be frozen, and the filling will stay nice and soft. Mmm! Aww, thanks (I certainly didn’t think so). Do like the bars, though. Thanks! I’d say it’s more interesting after the fact than during. . .but I’m really glad I did it. Thanks so much, and for your comment! The photo is actually deceiving, as my hair is quite thin. I chopped it all off a couple of years later (made the stylist save a big ponytail so I’d have a souvenir, then was so excited I forgot it in the salon!). I think the zucchini will brown only if you let it sit at room temperature too long before freezing. I stuff it in bags and pop in the freezer right away–no problem. When it defrosts, it seems a bit watery, but I just throw any liquid in the recipe along with the zucchini (I figure it was in there to begin with when fresh), and everything seems to work out just fine. You and the HH would get along; Snickers are his favorite candy bar. Backpacking through Europe–lucky you! That’s one trip I never did manage. I wouldn’t worry about the coffee–apparently, it has some health benefits in moderation, too. And thanks for the solidarity during the cleanse! Re: my hair, I cut it at age 19 and it’s been short ever since (with one short phase trying to grow it out again when I was married–hated the way it looked, though). I have quite thin hair, so I prefer it short and easy–about 2 inches all around. Oh, and now it’s blonde, too! Thanks so much–it was lots of fun to go through the old photos! And yes, crazy what games the media can play with teenaged girls’ heads. I’d kill to be that weight again, now! Sorry to hear you’ve got first-hand experience about the liver/anger connection! Luckily, it does pass in a day or two. It was pretty reminiscent of Snickers. . . if there could be a healthy Snickers, that is! Those have been on my to-do list for quite some time. Your look absolutely delectable! Congrats on your detox. Look at you! That Alice in Wonderland hair! Adorable. It seems to me that your sense of humor is still intact!! Glad the cleanse went well, getting back to eating simple foods is always a good thing. It’s certainly a good reminder to me! Ah, and I forgot to say that the raw milky way bars look sooooo good! Those raw treats look delicious! Congrats on a successful grain free week and completing the course. These are possibly the best sweet thing I’ve ever had – wow! Thank you so much. Possibly a bit much chocolate made and a bit runny but that just meant I had to force myself to lick it off my fingers (and restrain myself from licking it off the floor!) And I’ve got some left for next time – perfect. 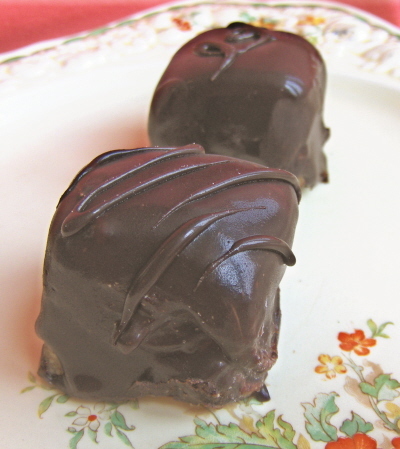 This is just a little note to let you know that I have featured your delicious looking coconut candy recipe on my blog. It always feels so good to enjoy a recipe like this Raw Milky Way Bars. Thanks for this recipe. I bet you are eating a lot of sweets my dear. Loosen up a bit. These Milky Way Bars are so good to have to end that detox.